Page 2 SPACEPORT NEWS Aug. 10, 2012 Mock-up Orion stack forging path to launch By Steven Siceloff Spaceport News he Vehicle Assembly Build i ng's (VAB) transfer aisle offered a glimpse of the future recently as a full-size Orion spacecraft mock-up was placed atop a model of the service module so engineers and technicians could determine the exact dimensions for connectors that will run from the launch pad structure to the space craft before liftoff. Orion scheduled in 2014 atop a Delta IV and 2017 for the Space Launch System (SLS), the work is critical to making sure the designs are ac curate, said Doug Lenhardt, who is overseeing the Orion mock-up and operations planning for the Ground Systems Development and Opera tions program, or GSDO. After all, changing a connector on piece of launch pad equipment can get costly and time-consuming. "The design is pretty far along for the capsule, so the sooner you can the designers to change, the less ex pensive it is, the more time they have to look at it and possibly redesign," Lenhardt said. "You don't want to vehicle." Stacked atop each other, the Orion crew module and service module mock-ups stand 27 feet tall. Techni cians can climb inside the capsule and see how the astronauts will sit for the launch and how much room is available to them during the months it may take for a mission to an asteroid, the moon or Mars. The model's full size gives designers a greater appreciation of the scale of the spacecraft, Lenhardt said. when they see this, I didn't realize it Lenhardt said. "When you go to computer-aided design models, you just don't appreciate the size." NASA routinely used mockups, also known as boilerplates or techniques for all of its human space craft programs. The Orion work is since the space shuttle. Many mockups are retired to public display, such at Marshall Space Flight Center in Alabama. Lifting and moving the mock-ups also provides opportunities for tech nicians to maintain and practice their technical skills. "Actually one of the big goals of the mock-ups is helping keep the said. "The crane guys are good, they're really good now because they were doing orbiters three or six times a year. Now, they're not lifting any nitely does help to keep everybody The mock-up has been used to medical technicians what to expect if they have to get astronauts out of the ship quickly. They saw very quickly that lifting astronauts up from their seats and out of the hatch is a lot different than it was aboard a space shuttle, Lenhardt said. "When you're trying to get a and rescue guys came up with re ally good ideas to help the closeout (crew) do their job, to get the guys out faster," Lenhardt said. The demonstrations already have T The mock-up components of an Orion spacecraft are laid out in the transfer aisle of the Vehicle Assembly Building at Kennedy Space Center on Aug. 6. In the foreground is the Launch Abort System, attached to the aerodynamic shell that will cover the capsule. To the right is the Orion capsule model on the Ground Systems Development and Operations program, click on the photo. approaches to handling the Orion spacecraft during launch prepara tions at the launch pad. For instance, a system of off-the-shelf scaffolds heavy protection gear to move around on, so a new approach is be ing developed. The Space Launch System rocket is slated to be taller than a Saturn V, which means operators will have to lift Orion and its service module almost to the rafters of the 525-foottall VAB to place the spacecraft on top of the SLS. With the steel and aluminum what work needs to be done before the spacecraft is lifted and what can only be done with the Orion mated to the top of the rocket. The Orion model, an exterior rep lica of the spacecraft that is mostly empty on the inside save for four model astronaut seats and hatch, was used to practice stacking the launch abort system, or LAS, ahead of a May 2010. Kennedy engineers have been using it to model their systems and demonstrate processing tech niques for several months, including placing it inside an experimental clean room. For a service module, though, there was nowhere to turn to get a mock-up, Lenhardt said. So Kennedy designers came up with a framework and metal cylinder that would be the same dimensions as the service module and support Orion's weight. NASA and Boeing prototype shops turned the designs into the real model. An operational service module holds propellant and consumables tanks, power-generating solar arrays, instruments and other hardware as tronauts need. It stays attached to the Orion capsule until re-entry, when the capsule separates to return the crew to Earth. "Ours is built just for the ground. It couldn't take the launch loads, the vibrations," Lenhardt said. "We only needed to simulate the outside. This is how the Orion vehicle will come to us from the Operations and Checkout Building, where it is as sembled. So now we can do any of the operations, simulate them, with a Because the VAB's transfer aisle is vast, it can be used to simulate other facilities, too, so work that will take place in other areas of Kennedy to perfected without moving the mockups around. The model also includes an aero dynamic shell that will anchor the LAS rocket to the spacecraft. In an emergency, the LAS would ignite and pull the Orion spacecraft to safety. Workers in the VAB have not stacked a rocket with an LAS since Apollo missions ended in 1975, be cause the space shuttle did not have such a mechanism. "Is it better to stack the LAS when it's on top of the rocket? Is it better to stack it on the ground here and then lift the whole thing on top of the rocket?" Lenhardt said. "Those are the kinds of things we can try out here." With the pace of work increasing the horizon, Lenhardt said excite ment is building at Kennedy. "We've got this, and with the EFT-1 spacecraft showing up in the Operations and Checkout Building, it shows people we are moving down a path," Lenhardt said. NASA is mov ing forward and it's starting to get pretty exciting." 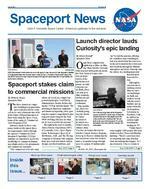 Page 3 Aug. 10, 2012 SPACEPORT NEWS NASA chief technologist praises Kennedy innovations explorer to operate longer. By Steven Siceloff Imagine, on Earth, a car that instantly shakes off Spaceport News Aheat shield partially dust and dirt itself. Hogue made from Marsaid auto companies already tian or lunar soil, have made early approaches lighting that allows plants to to mirror the technology. grow in space and special "The success they've had ized containers that keep here with turning out their astronauts from getting products and embracing infected by biological exthe business community is periments were some of the really unparalleled," Peck technology developments said. "When we spend shown to NASA's chief money on the nation's space technologist during his visit program, we're not spending to laboratories at Kennedy it in space, we spend it right Space Center on July 30-31. here on Earth. NASA has Although known for piomade contributions to our neering tools and techniques American life." to prepare payloads and Peck also was shown launch spacecraft successsome of the payload techfully, Kennedy also works nologies developed at Kenwith its partner Space nedy that allow experiments Florida to operate labs to be performed safely on for scientists performing the International Space cutting-edge research in Station. Kennedy researchers have produced payload "It's very exciting to be Dr. Mason Peck, NASA's chief Technologist, examines an innovative conductive material during a tour of the Space Life here at Kennedy Space Sciences Laboratory at Kennedy on July 30. Peck also toured the center's Operations and Checkout Building and Shuttle 51 times on shuttle and sta-Center because one of the tion missions, David Reedhis two-day visit.best parts of my job is thinktold Peck, and another seven ing about the future," said such things, too. One of Peck's duties is to just say, 'I'm just doing my Mason Peck, NASA's chief "If you really want to help technologies developed job.' We hear that so often." including an upcoming technologist. "That's one of geek out about technology, for space make their way Some of the technologies the reasons I wanted to do which is what I like doing, into the commercial market "One of the very exciting you have to come to a place for use on Earth. He was commercial applications things about NASA these Peck, who has been in his like KSC," Peck said. told that center researchers sooner rather than later. A days is we are looking to the NASA post for six months, The Morpheus lander have long developed innoprime example of that is future. We've got a lot on has been visiting NASA vative devices. a system that electrically our plate, a lot of exciting centers to see up-close what the Shuttle Landing Facil"We have a lot of people repels dust and dirt molwork being done, a lot of developments are under ity also was shown to Peck, who do really great things ecules from a metal surface. it's being done right here at way. The trips are important along with an Atlas V rocket and they don't know it," Michael Hogue's team Kennedy," Peck said. "Right for a variety of reasons, but that United Launch Alli-Martin Belson, president developed it to keep solar now, with NASA, we're seePeck said there is a certain ance is prepping for a future panels clean on Mars and ing a return to what I'll call element of fun in seeing mission. Industries, told Peck. "They the moon, enabling a robotic our innovation roots." From CURIOSITY Page 1 see them succeed and see this thing on the surface." Before the mission was launched, and landing would be, Baez said the rover landed and returned some video and photos of the barren Mar tian landscape. That goal has been met, but Baez said he is on to the next level of expectations from Curiosity. "I think I'm still numb, I'm still waiting for more pictures," Baez said. "I want to see the thing roll around and rove. I'm not ready to pop the champagne corks yet." The landing buoyed the whole launch team. "Everyone's walking with a spring in their step, just having a good time," Baez said. "Overall, it's a great feeling." Even after launching eight spacecraft to Mars, Baez' work with Launch Services Program is working toward the launch of the MAVEN mission, a spacecraft that will study Mars from orbit. MAVEN, short for Mars Atmosphere and Volatiles Evo lutioN, will look for clues as to why the Martian atmosphere changed and why its surface water was lost to space. It is scheduled to launch in late 2013. As for Curiosity, it is the most powerful rover ever sent to another world and is taking tools to drill into and sample soil and rocks, along with lab mechanisms to experiment on the material directly, albeit mil lions of miles from Earth. "One of my greatest thrills is to go to schools and speak to kids and one of the amazing things is being able to pull up a site and show them live pictures of (the smaller NASA rov ers) Spirit and Opportunity on the surface of Mars, and I can't wait for the day I can do that for Curiosity and show them that our presence is somewhere else besides this planet," Baez said. "And it's not just Curiosity, it's the other two rovers, its the orbiters and a lot of people don't realize that." Aug. 10, 2012 SPACEPORT NEWS Page 5 Scenes Around Kennedy Space Center NASA Kennedy Space Center employees George Haddad and Josephine Santiago-Bond graduated from the 2011-2012 Systems Engineering Leadership Development Program (SELDP) on June 20 at NASA CLICK ON PHOTO from July 31 to Aug. 2. Students and parents participated in workshops and facility tours. The group got to view an IMAX movie and rode on the Shuttle Launch Experience. allows parents to showcase their place of work, aims at encouraging the study of and potential careers in Science, Engineering, Math and Technology (STEM). More than 200 children participated. Page 7 Aug. 10, 2012 SPACEPORT NEWS Remembering Our Heritage Social media followers hear stories of Kennedy's 50-year history By Bob Granath Spaceport News While the 50-year history of the Kennedy Space Center includes power ful rockets lifting off on historic missions to Earth orbit and beyond, it also is a story of dedicated and talented people working as a team. About 45 of NASAs social media followers gathered at the spaceport Aug. 2-3 to hear from key past and present leaders who related stories of the space agency's efforts to explore the unknown. It was the by Kennedy. A relatively new phenomenon, so cial media enthusiasts use weband mobile-based technologies to com municate with followers in interac tive dialogues. Reaction was posted instantly on Facebook, Twitter and similar media. NASA Administrator Charlie Bolden was among those who ad dressed the group explaining the space agencys approach to planning for the future. People today want to see perfor mance, he said. Thats the course weve been trying to set over the last three years or so. Establish some goals for NASA, tell people when we are going to do it and how much its going to cost -as best we can determine -and then try to do it. Today, for humanity, I think Mars is the ultimate destination, Bolden said. The NASA Social also featured speakers who worked across the river in the earliest days of Project Mercury and were a part of the orga nization that became Kennedy. "It was a different era when we began," said Jack King, NASA's "The (Wernher) von Braun team transferred to NASA and Kurt Debus came down here to the Cape, setting up the Launch Operations Center in 1962. We were in a space race between two super powers -the United States and the Soviet Union." Speakers recalled how the na tion pulled together to achieve the remarkable goal of landing on the moon before the end of the decade. exclusively by Kennedy. "Going to the moon wasn't a big deal to me, (the big deal) was what it took to get there," said Lee Solid, a retired senior executive with Rock well and Boeing. "I can't imagine anything more exciting." The social media participants represented varied backgrounds including an engineer, a law profes sor, a stay-at-home mom and a selfdescribed "NASA nerd." What they all had in common was an interest in the space agency's efforts to explore and utilize space. One participant, University of South Florida student Joey Vars, recollections helped him get a better feel for the effort involved in going into space. "When you hear from people who lived the history, you understand what it took to do what they did," said Vars, who goes by "RocketMan" on his Facebook page. After listening to recollections of Kennedy's history, anecdotes and achievements, several social media participants had high praise for the space center's team. "The dedication and pride of the people who work here is amazing," said Kim Davis, a fourth-grade teacher from Auburn, Ala. "I sure appreciate their contributions." Another participant, Dan O'Shea, is a professor at the University of Phoenix campus in Tampa, Fla. He has more than 5,500 followers on his Google Plus account. "I started following NASA's programs in the 1960s," O'Shea said. "I'm still fascinated by what goes on here." Space Gateway Support President CLICK ON PHOTO About 45 of NASAs social media followers listened to speakers Aug. 2-3 during two days of presenta Roy Tharpe recalled the uncertainty that was inherent during the early part of a surveying crew for Cape Canaveral's Launch Complex 34, he watched a rocket lift off just to the south. "It launched up about 350 feet and turned left . right at me," he said. "I jumped to the ground just as it exploded." "Imagine a rocket taking a turn and heading straight for you. Yikes!" Davis posted on her Facebook page. Tharpe was later a part of the team that helped prepare for construction of the Vehicle Assembly Building and other elements of the complex humans to the moon. Solid recounted the development of rockets and their engines through the relatively small Redstone, Jupiter and Thor-Delta programs to the breakthroughs that resulted in power ful engines for the Saturn and space shuttle launch vehicles. machine than the space shuttle main engine, or SSME," he said. "In fact, the SSMEs are now being readied for use on the Space Launch System." The Space Launch System is an advanced, heavy-lift launch vehicle that will provide a new capability for human exploration beyond low Earth orbit. Another Apollo veteran to address the group was former Kennedy Space Center Director Jay Honeycutt. After serving in various roles in the Vehicle Simulation Section at the Johnson Space Center dur ing the moon landing program, he transferred to Kennedy, serving as director of Shuttle Management and Operations and as center director. "The center director is like being mayor of a small city," Honeycutt said. "You try to keep between 12,000 to 15,000 people pointed in the same direction." Dr. Liz Warren, communications coordinator for Kennedy's Interna tional Space Station Program Sci pants to join a friend some evening or early one morning in watching history in the making as the station "Be sure to tell your friend some great factoid about the space station," Warren said. "For example, did you years, over 1,100 investigations were conducted by researchers from more than 60 countries?" Thomas Engler, deputy manager of Kennedy's Center Planning and several speakers who updated the space centers plans for upcoming programs. "There is a lot of exciting work on going to position us for the future," he said. "The next 50 years will be much more diverse than the past." After hearing about NASA's Commercial Crew, Launch Services and center development programs, Emily Carney tweeted a message with a common theme among the days social media participants. "Just like to let everyone know that NASA is NOT going out of business," said Carney, a journalist from St. Petersburg, Fla. The social media participants also toured the historic launch pads of NASA's early days and the presentday facilities that supported the Space Shuttle Program and Ken nedy's transition to the future. "You know the Vehicle Assembly Building is big," O'Shea said. "But, my gosh, I was surprised by the size inside. It was also great to see (the space shuttle) Atlantis up close." The event concluded with Ken ever multi-center simulcast, preview ing the landing of the Mars Science Laboratory's Curiosity rover. Page 8 SPACEPORT NEWS Aug. 10, 2012 By Linda Herridge Spaceport News everal young students and the Florida Institute of Tech their lightweight aircraft north and touched down at Kennedy Space Centers Shuttle Landing Facility (SLF) on July 20. It just happened also to be the 43rd anniversary of the Apollo 11 moon landing. Though not as historic an event as a moon landing, to the seven middleand high-school students who are participating in FIT Aviations Av/ Aero summer camp experience, their touchdown in Piper Warrior and Cessna 172S aircraft at the SLF was Torsani met the group and accom panied them on their tour of several facilities. They gathered in a support building near the SLF to hear from Kennedy Director Bob Cabana who shared stories of his interest in becoming a test pilot and eventually becoming a NASA astronaut. Make sure you enjoy what youre doing, Cabana said. And con tinue to set those goals. Dont limit yourself. Youre capable of doing anything that you set your mind to if you apply yourself. FIT Aeronautics Outreach Coordi NASA Employees of the Month: July S Kennedy was one of the highlights of the Av/Aero Experience. From landing to takeoff, our tour was engaging and informative, Sisk said. Everyone welcomed us warmly. Four students from Brevard County, two students from Washing ton state and one student from Texas, plaques marking wheels stop for each and two NASA Huey helicopters in Director Rick Svetkoff, and toured the Vehicle Assembly Building where space shuttle Atlantis tempo rarily is stored. Tenth-grade student Nicholas would like to attend the Naval Academy and acquired his interest in In celebration of Kennedy Space Center's 50th anniversary, enjoy this vintage photo . FROM THE VAULT This aerial view shows construction of the Operations and Checkout Building (previously known as Spaceport News employees. Contributions are welcome and should be submitted three weeks before publication to Public Affairs, IMCS-440. Email submissions can be sent to KSC-Spaceport-News@mail.nasa.gov Managing editor . . . . . . . . . . . . . . . . . . . . Candrea Thomas Assistant managing editor . . . . . . . . . . . . . . . . Stephanie Covey Copy editor . . . . . . . . . . . . . . . . . . . . . . . . Kay Grinter NASA at KSC is on the Internet at www.nasa.gov/kennedy aviation from his father, a pilot, and his great grandfather, an Air Force Eighth-grader Sean enjoyed the It was very cool seeing the jets, helicopter in the future. Cody, an eleventh-grader, said he Naval Academy. FIT Aviation Director Glenn Vera who accompanied the group of students, said, NASA and the entire KSC team have long set as one of their goals to inspire the next genera tion of aerospace explorers. With succeeded in accomplishing that goal today. Tennesse Garvey is FIT Aviations retail program supervisor. He and the other instructors were just as excited as the students to be at Kennedy. The Av/Aero Experience is the by FIT, Garvey said. It is such a unique opportunity to experience the tour of Kennedy Space Center and hear from Center Director Cabana. Assistant Chief Flight Instructor Shannon Ferry said the Av/Aero and other FIT summer aviation camps were designed to expose young adults to the aviation industry which We are so grateful to NASA for this experience. It was out of this world, Ferry said. Sisk said through FITs basic Summer Flight Camp, Advanced Aviation Academy and now, the hybrid aviation aerospace camp, or Av/Aero Experience, she has the privilege of watching young people dent student pilots. It was an honor getting to host these future aviators -who knows, maybe future astronauts, Torsani said. Their enthusiasm, curiosity and initiative are just what we need in the next generation of aerospace pioneers.